It is very ease with the tab facility In Computer Windows. Due to tabbed interface all windows of a program remains inside in the program which make easy to work and save from bore. But there are several programs that we use in our daily basis life and there is not tabbed facility therein like in Notepad. In this way when we open many windows of likewise program, it creates much difficulty during working. 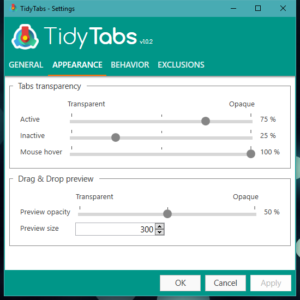 So if you install “Tidy Tabs” Program, you can get tabs facility in any program/application. One positive point of this program is that you can make tabs of windows of your choice. It is not necessary that all open windows of a program become tabs there selves. For examples five notepad files are open in your computer, you can make tabs of three or four files and other(s) can be made separate. Furthermore, you can change the sequence of tabs according to your choice and necessity; you can drag any tab to change its location forward or backward like we do in browsers. Tidy Tabs is completely customizable means you can change it whenever you want according to your requirement. The founder company of Tidy Tabs has said that coding has been done with very clarity therefore their program work very efficiently and don’t put any burden on your computer while working.